Times change, but our dedication to perfecting the travel experience never will. 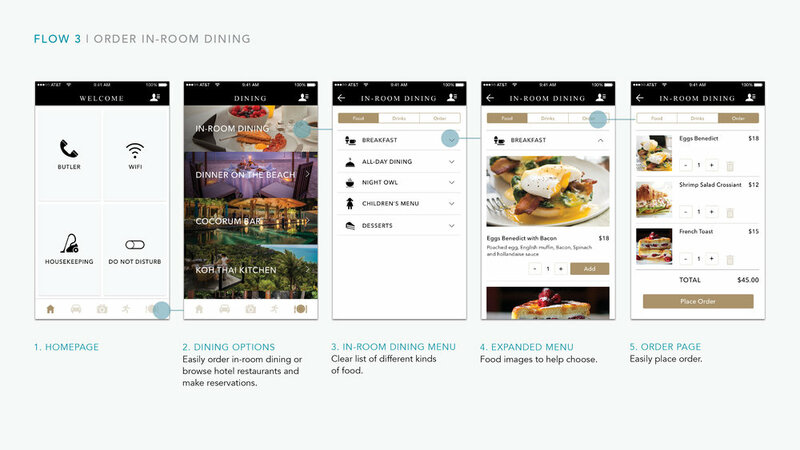 How might Four Seasons improve its digital products to further improve travelers' experiences? Because booking sites such as Priceline, Kayak and Hotel Tonight offer room discounts, few customers are booking on Four Seasons' own website. Hoping to attract more travelers, especially tech-savvy travelers to book on their own site, Four Seasons would like a redesign of their digital experience. The challenge is that the redesign must be more than a place to research and book a room. It has to differentiate its offerings and deliver a superior experience. Design strategy played an important role in this project. Current Four Seasons digital experience does not offer unique values for travelers. We compared the Four Seasons website and app with other travel services. Even though the existing Four Seasons website had many interesting contents, the structure was too complex and difficult to navigate through. The existing app has an overall rating of 2.5 out of 5 in the app store. It crashes easily and does not provide practical features that users ask for. Compared to 3rd party websites. Users are looking for an experience not just a place to stay. We went to premium hotels and interviewed more than 20 people of different backgrounds. The insights became very useful later when we were building personas. All personas care about service. There is potential to improve service with the help of digital products. After a few rounds of affinity mapping, we summarized the pains and needs and created four personas. Personas were helpful for us to be more empathetic. We realized that service is important for all of them. Since Four Seasons is known for its superb customer service, we decided to focus on highlighting service on the digital products. A unique 3-stage solution to cover the before, during and after a trip. 4 of us brainstormed together and agreed on the overall strategy. Then we split into 2 pairs. One pair worked on the website while the other worked on the app. My focus was the later. From this point on, the case study focuses primarily on the development of the mobile app. Sketch, wireframe and prototype to achieve an effortless experience. Usability testings helped us identify problems and improve the experience. By observing how users interact with our app, I realized that many of our initial design decisions were based on our assumptions. There were problems. For example, on the homepage, we want to give users the most useful features, however we were wrong about what features were the most useful. The colors help enhance the premium feeling of the brand. While gold is the classical color for luxury, turquoise adds an element of friendliness and freshness for younger users. Every task can be done in a few clicks. I was responsible for most of the interface designs. I looked closely at similar hotel apps, such as Ritz-Carlton and St.Regis to learn how to achieve the luxury feeling that our users are looking for. Since travelers are on-the-go, we made every task as simple and quick as possible. Survey failure taught me the importance of doing usability testing before sending it out. It was our first time to work on a survey and we were not sure how to word certain questions clearly. After we sent out the survey for a few days, I watched someone completing the survey and noticed her confusion with a few questions. I watched two more people completing the survey and noticed similar problems. As a result the survey results were not reliable or useful. UX design is not just about the digital products, but the whole experience both online and offline. Walking through travelers' journey helped us realize the potentials outside the website and app. As a result, we thought of the photo album. We've received positive feedbacks from others about our solution especially about the photo album. It has great potential to truly improve travelers' experiences.